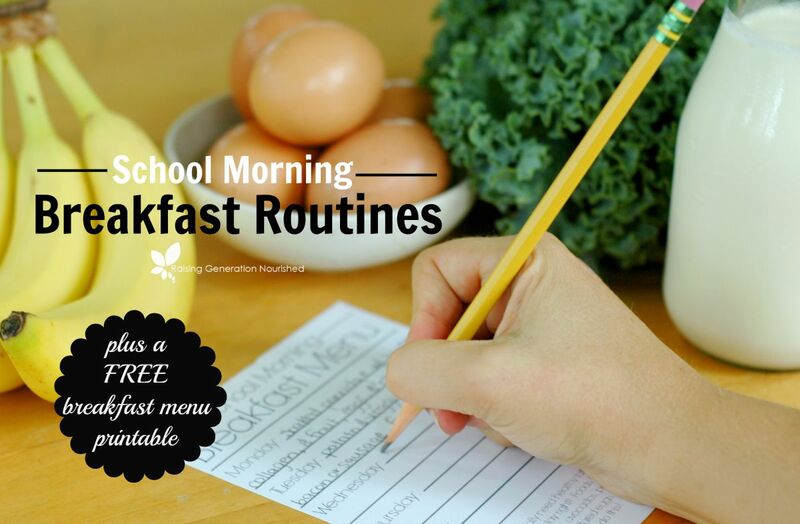 Keep busy school mornings low key & low stress with a simple breakfast menu to fit how *your* family does mornings! If there is anything that my first year of having a kid in full time school taught me last year, it is that I needed to make mornings as low key and less stressed as possible. 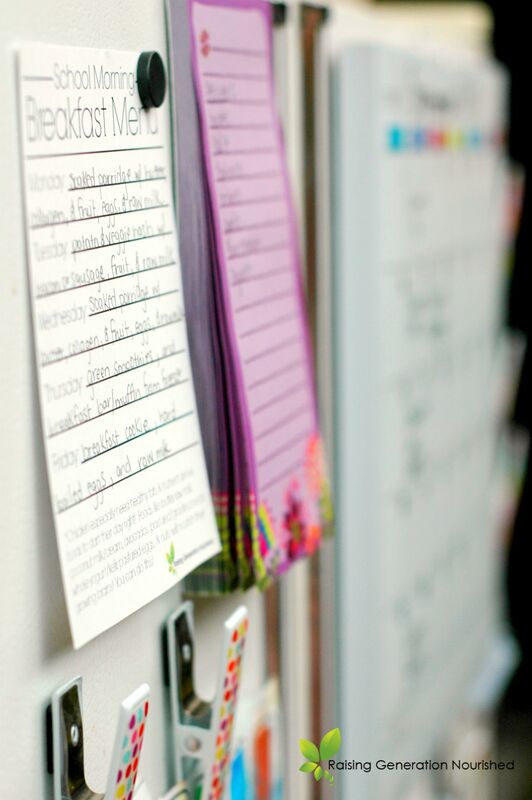 We had our fair share of “rushed out the door” mornings, and I just hated that feeling of stressing my kids out before their day of learning. We ended up sort of falling into somewhat of a breakfast “menu” by halfway through the year, and I decided that this year, I want my mornings to be as no brainer as possible. I know it. It’s all the rage, but I just haven’t gotten into it. I “plan” as in when I go get groceries I buy what is in season. I buy what is on sale. And then I do something with what I’ve got. It’s not a bad approach – it works for me for right now! But I decided I needed a “framework” for morning. As in the same general plan for each day of the week. I want variety – and I want flexibility so that I can plug in what food is in season or on sale. So I did it. I created a quick list to go by that has enough “give” it in that we can plug in for instance whatever fruit is in season or on sale, whatever veggies happen to be in the house that week, etc. I have it up on the fridge in a small spot so I can reference it the night before, and it doesn’t take up a lot of space. I wanted to share my breakfast menu with you! But listen! We all run different households! 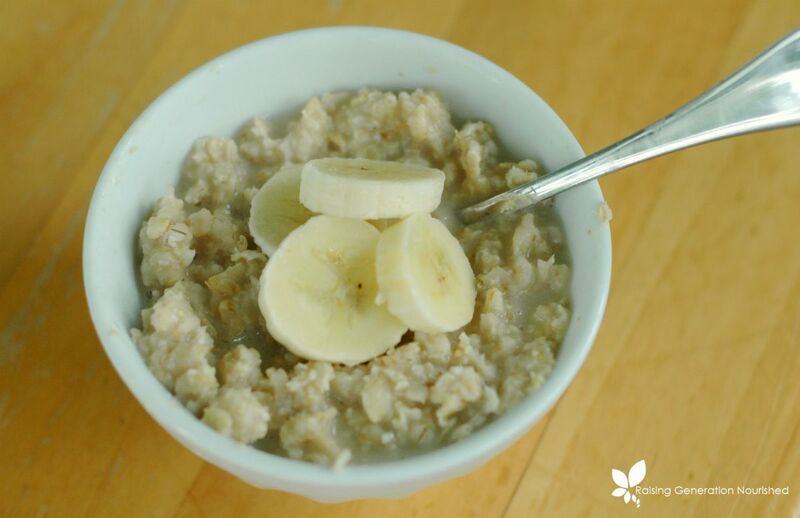 What we do for breakfast doesn’t matter, as long as it is nourishing and clean in my opinion, so do what works for your family and where you are in your real food journey, food allergies, and preferences! My suggestion would be to sit down as a family (YES kids included!) and make the menu together. That way everyone gets a “say,” some favorites get on there, and you can make sure it is balanced and nutrient dense. MONDAY :: Soaked porridge (oats, buckwheat, or millet etc) with butter, grassfed collagen , & fruit, eggs, and raw milk or kefir. TUESDAY :: Sweet or white potato & veggie hash with bacon or sausage, fruit, and raw milk. WEDNESDAY :: Soaked porridge (oats, buckwheat, or millet etc) with butter, grassfed collagen , & fruit, eggs, and raw milk or kefir. FRIDAY :: Breakfast cookie from the freezer (we like these Ultimate Breakfast Cookies & Lemon Breakfast Cookies! ), hard boiled eggs, and raw milk or kefir. Ok so it’s your turn! 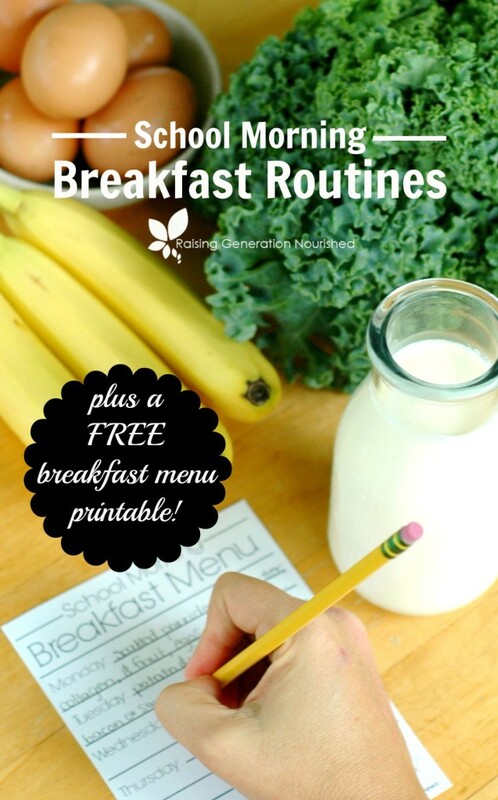 Here’s your *free* School Morning Breakfast Menu Printable to make your own school breakfast menu! Keep me posted how this has helped you! I’m sure as we get our feet wet as school starts I may change things up on our menu a bit, but for the most part it is nice to know breakfast is one less thing to have to think about! Tag me up on Instagram with your menus! 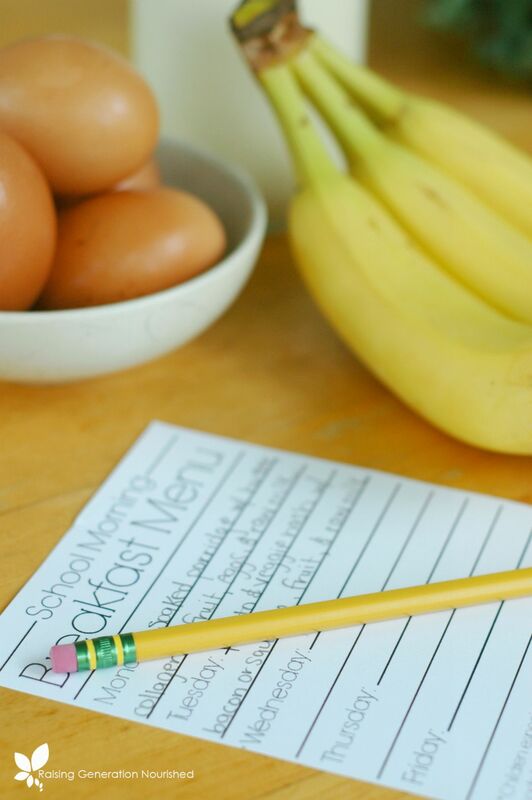 I really like that you encourage your readers to plan whatever breakfast works for them and their families, as long as it is clean and nourishing. In my case, I am best nourished and satiated for hours if I consume animal foods such as eggs, raw milk yogurt, raw milk kefir, raw milk cheese, etc. for breakfast rather than soaked oatmeal. I do often enjoy warm foods. I don’t mind eating the same breakfast often. I don’t eat much fruit. Even a whole banana is much to sweet for me. We are all so individual! Yes we are Sandrine! Great point! And I think that is why I wanted that blank menu instead of one with lots of options. 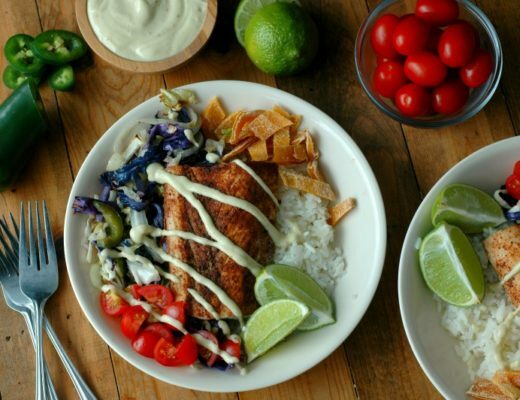 I actually end up eating dinner leftovers most mornings (meat and vegetables or soups) and my girls do best with a little more in the way of some grain or carbohydrate along with lots and lots of fat. I think kids burn through those energy giving carbohydrates so much faster than adults! We are definitely all so different! Oh my goodness, love this! It gives the kids something to look forward to also. LOVE soaked porridge. It all sounds lovely! Thank you for the printable! I don’t meal plan either, but like you, I try to have good, nourishing foods on hand for breakfasts, and to do as much as I can to do myself a favor by cooking ahead. Great post! I really like the fact that you stress the idea of getting the children into the discussion and hearing their ideas. I think that is so important, especially for their cooperation in creating a stress-free morning routine. Absolutely love this idea! Shared and pinned! This is great! 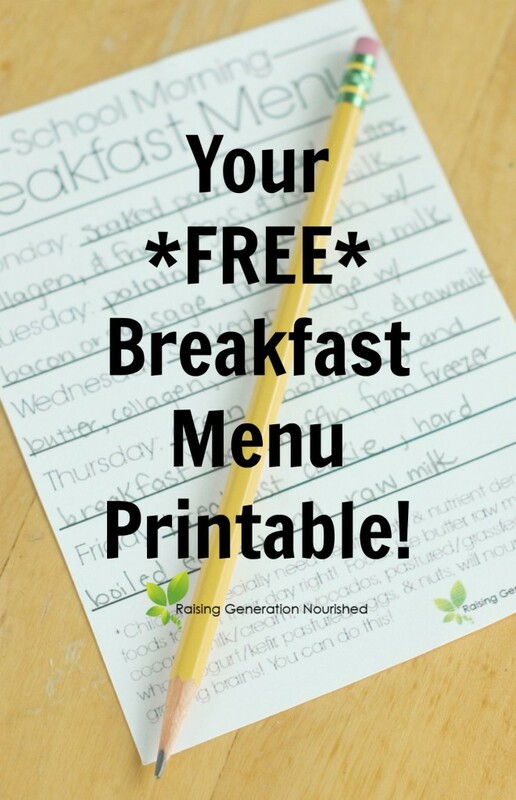 Cool printable menu too! I don’t menu plan either! I have to say though that it really helps de-stress choosing meals for the week. My fiance and I are both the easy going “I’m fine with anything” type. Deciding what to eat for any meal is a ridiculous cycle of “I don’t know, what do you want?” that can go on and on until I finally just choose something. Needless to say when I have littles of my own I will be implementing this to make life easier….I can’t imagine how laid back they will be! I really don’t like meal planning (I’m like you…buy the food and figure it out), but it makes life so much easier. Also, bulk cooking! I need to do more of that so I can reheat dishes without having to start from scratch every time. Your breakfasts sound so yummy. I’m ready for the cool fall weather (probably won’t happen here for a few more months) so I can dig into oatmeal again. Thanks a lot for the great post! very very helpful for other mothers like me:) I have a quick question, you kept mentioning to “raw milk” on atleast 3 days from your weekly breakfast menu. I’m just wondering what milk it is…regular cow milk or anything in particular? Please clarify. Hi Swarna! Raw milk being fresh milk from our family’s farmer – it is not pasteurized or homogenized. Raw goat’s milk would be fine or whole coconut milk as well. I don’t have any recipes on the site for buckwheat or millet porridge but I will get to that this fall! You can cook the grain as the box recommends and use the flavor ideas from the oatmeal post linked above for flavoring them though! I love the idea of a frame work rather than menu planning. 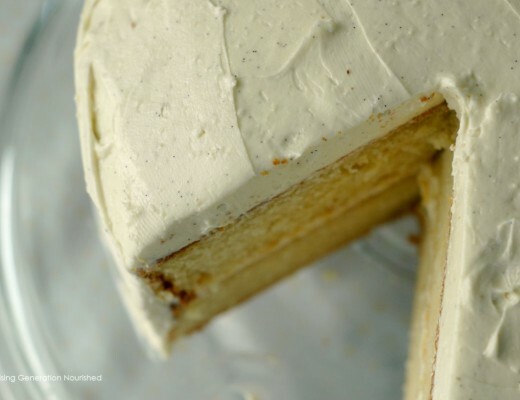 Menu planning can be so overwhelming! I’m wondering if you have a way to prepare or make ahead your hash? That sounds like a great idea for variety, but I wonder if it would take a long time in the morning? Hi Shannon! That is a great question – I really should blog that! I do just do a quick chop in the morning and it fries up pretty quick – but I am also up before the kids anyway so it isn’t a big deal. One thing you could do that we do quite often is have a big breakfast on the weekend and make sure the hash is doubled so that there are leftovers to re-heat on a school morning so that might work better for you! As a young kid I grew up hearing that raw milk has bacteria/germs and should not be consumed without bringing it to boil? I didn’t know until now that we can drink raw milk as is. This is SO great! Breakfast is where I struggle to plan and this will help so much! We always end up with something nourishing since I have muffins, bars and such in the freezer, always have whole milk plain yogurt on hand and I make smoothie kits for the freezer, but when we wake up I’m never sure what to have then have to scramble to get it all ready! I am very good with lunch and dinner planning, now this will help with the breakfast! Thanks so much! Now, to get ready for school next week!!!! Thanks a lot for taking the time to share all the information about raw milk. Much appreciated. I will read through these links over the weekend. Hi Renee, this is so helpful. I never realised you could prep oats that far in advance! Quick question though – on the menu it says soaked oatmeal with collagen, however there is no collagen in any of the oatmeal recipes. How do you incorporate the collagen into the oatmeal and how much please? I’ve never used it before but am just about to order some. Hi Natalie! Yes for sure! I just stir in a couple teaspoons into their bowls as I make them – the cold soluable gelatin just stirs right in! I’m wondering why you steam the kale for the green smoothies? Is this better than fresh kale? We drink green smoothies all the time so this would be good to know 😉 thanks! Hi Danielle! Lightly cooking/steaming the greens reduces the oxalate load – so especially if having green smoothies often, it is a good idea <3 I hope that helps!